Barstow’s Dairy Store and Bakery and Barstow’s Longview Farm are proud supporters of Kestrel Land Trust, a local nonprofit that protects and cares for land in the Pioneer Valley. 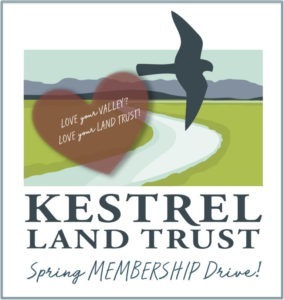 Kestrel Land Trust has just launched their Spring Membership Drive! Kestrel helped Barstow’s Longview Farm APR our farmland for generations to come. This not only means our land is protected, we were also able to reinvest into the farm by purchasing our 5 robotic milkers! Here’s the whole story. Keep food local and farmers farming! Kestrel secures critical funding to make this happen! Our farm, our town, our Valley would not be the same without our resident bald eagle, roving deer, and beautiful barred owls. Kestrel protects open spaces and wildlife habitat! Our Pioneer Valley identity comes from open farmland and healthy ecosystems. Protect them – forever! If you give in the month of April, you’ll be entered into a drawing to receive a $25 gift card from Barstow’s Dairy Store and Bakery – along with a number of other local business gift certificates! Become a Kestrel Land Trust Member now!